The origins of tai-chi chuan are highly contentious with numerous different accounts, most of which appear to rely on anecdotal or circumstantial evidence. Tracing the history of Chinese martial arts is hampered by a low rate of literacy among past masters and the population as a whole. It is important to note therefore that few Chinese martial arts can trace their particular style back more than a few hundred years yet all are based on techniques and strategies that have evolved over considerably longer periods of time. What history we can be certain of however is that all the five major styles of tai-chi chuan can be traced back to Chen jiagou (the Chen family village) in Honan province and to Chen style tai-chi. The origin of Chen style is usually accredited to Chen Wang-Ting (1580–1660). He is recorded as having developed several forms after retiring to his home village from the army. This account does not refer to tai-chi by name which may have been coined at a later date. Tai-chi has also been referred to as 'touch boxing', 'soft boxing' and 'the thirteen techniques'. Where and how it actually began is shrouded in uncertainty. Some say the art originated in Chen village while others say it was introduced to them by an outsider. Another possible link in the development of tai-chi is Wang Tsung-Yeuh who is generally accredited with the authorship of the 'Tai-Chi Chuan Lun', a classic tai-chi text. He is known to have taught internal style fighting and came from the same province as that of Chen village but in exactly which period of history is disputed. It is possible that a flow of knowledge occurred between him and the Chen family but the direction of that flow cannot be determined. Chen style was, for the most part, kept within the family until the last century but history records that there was one important exception. About 175 years ago Yang Lu-Ch'an (1799-1872) learned tai-chi from Chen Changxing (1771–1853). He became the founder of Yang style and taught openly outside the family thus beginning the spread of tai-chi throughout China. Popular legend has it that tai-chi chuan originated from Zhang San-Feng of Wu-Tang Mountain in the 12th century. 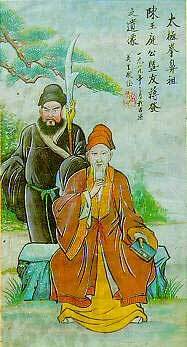 The legend has it that Zhang San-Feng had learnt the fighting arts in his youth and had become a Taoist monk in his middle years. One day he saw a fight between a snake and a crane and interpreted their movements as yin and yang respectively. Wanting to pass on his wisdom, he developed a fighting style that embodied these principles. Zhang San-Feng was reputed to have lived to an exceptionally old age and is regarded by some as being the author of the Tai-Chi Chuan Ching, a manuscript in the tai-chi classics. Modern scholarly studies suggest that it is more likely that the Ching was written by Wu Yu-hsiang or Li I-yü and that the legend of Zhang San-Feng is a myth but this is strongly disputed by traditionalists and the legend is still imparted as fact in many tai-chi systems. Within the last decade or so a number of historic documents have been discovered. Three of these originate from a small village called Tangcun where Li is a common family name (though no relation to Li I-yü of the tai-chi classics fame). One document claims that Chen Wang-Ting and his cousins Li Xin Yan and Li Zhong all studied at the Taiji gate of the Thousand Year Temple where they learnt '13 taiji health cultivation postures' and 'back-through art' from a Taoist monk. Another document is a martial art manuscript dated 1591 and attributed to Li Chunmao, the contents of which are almost identical to that found in the tai-chi classics. If authentic, this would be the oldest known written account of the art. A full account of this new evidence can be found in Fighting Words by Douglas Wile.